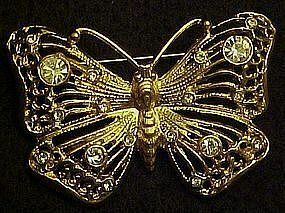 Pretty gold filigree pin is not signed but is so pretty. Crystal rhinestone accents on each wing. Measures 1 1/8" x 15/8". Nice pin back and is in like new condition. Would make a wonderful gift.